Fortuna in the past 8 months have brought a flurry of products to the GPS market place, covering a complete range including Compact Flash GPS Cards, Handheld GPS, Bluetooth GPS, Standard and XTrac models, in this review we will be reviewing the new Fortuna Clip-On Bluetooth GPS. The Fortuna Clip-On comes in two colour's, a gray or a metallic blue. Personally I prefer the blue, it looks much nicer than the dull gray. 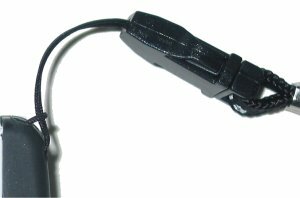 The Fortuna Clip-On uses the latest SiRF IIe/LP chipset to give support for both SiRF Binary and NMEA, as well as support for WAAS (Wide Area Augmentation System). But wait! It also supports SiRF's new XTrac, how's that ? Fortuna have done something special here, currently SiRF only provide their standard SiRF IIe/LP chipset and also the XTrac in two different chips. What Fortuna has done is to create a system where you can switch between the two chips and firmware and give you the benefit of both worlds by using STandard mode when you want, and then to switch to XTrac mode when you need it the most. Fortuna also are the only company to hold a Patent Pending on this technology and have beaten all other GPS companies to the finishing post. This gives Fortuna a very good advantage into the world of XTrac, but you may find SiRF having a combined switchable chip in the near future, time will tell. When you see photos of the Fortuna Clip-On, it really is hard to tell how small it is, when you take it out of the box then and only then do you get to see the compact size of this GPS Receiver. Fortuna hasn't been a name that has been known for quality products in the past, but they are known for more innovative products. The GPSMart was a handheld coupled with Bluetooth, putting dual modes into a CF card was a first, and now not only have Fortuna put dual modes into a Bluetooth GPS Receiver, but it's the first Bluetooth GPS Receiver to occupy such a small footprint in size, and to sport a removable Nokia style Lithium battery! If there's an innovative award for GPS Technology then Fortuna really do have to steal the award for the year for this. The Clip-On is unique in many ways, but Fortuna hasn't brought a product to market sacrificing quality either, far from it! I think Fortuna have learnt from their mistakes, and the Clip-On is a great little product. You'll find not only the GPS Receiver, but an 8 hour battery, a neck cord and also a see-through clear plastic pouch which clips into a belt clip also supplied (more about these later). So not only can you wear the GPS Receiver on your belt, but it's so small that you can wear it like a pendant around your neck, and I tried this for a few days and it not only works well, but due to it's size and weight you hardly know it's there. Make no mistakes, Fortuna have created a good product here and it's one to lead the market with. 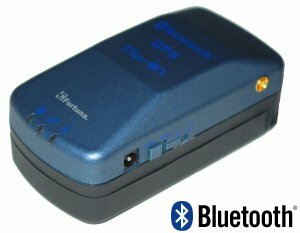 The first Bluetooth GPS Receiver we saw to do this was Emtac, The GlobalSat overtook this in battery performance alone, the Holux GR-230 then overtook this both in battery power and performance and now the Fortuna has taken the full monty. The Fortuna has a modular setup, which makes it more like a mobile phone. The Fortuna Clip-On comes apart with a user replacement battery and a battery cover. Fortuna also provide you with a screw to make sure the battery cover stays on, and a screw driver bit! One thing that sets the Fortuna Clip-On BT GPS apart from others is that it has a removable Li-Polymer battery. 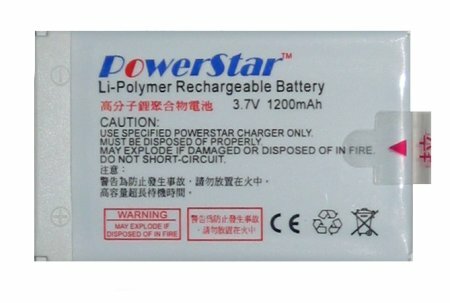 The battery is rated at 3.7V, 1200mAh and Fortuna say is a regular style Nokia Battery clone, so finding replacement batteries in a year or two shouldn't be too much of a problem. 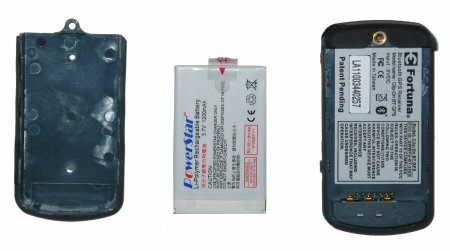 We decided to challenge Fortuna and take a battery from a regular Nokia phone, and the dimensions of the battery were identical, but the voltage slightly less at 3.6V, however using the battery in the Fortuna Clip-On was no problem whatsoever, it powered it up and started to acquire a fix, so you really can use a Nokia battery! This bodes well for Bluetooth GPS Receivers as most batteries are internal and not user replaceable and only offer around 400-600 charges which gives you a life expectancy of 1-2 years for your Bluetooth GPS, but not with the Fortuna! The Fortuna Clip-On Bluetooth GPS like many GPS Receivers comes with three lights or LEDS. These give various descriptions to how the GPS is functioning. The first LED is that of Bluetooth, and this will flash blue when a constant Bluetooth connection is bonded between GPS and a Pocket PC or Mobile Phone. The second LED is for satellite connectivity and is orange (or red) when XT mode is enabled), and the last LED is the Power LED which is green. ST stands for STANDARD and XT stands for XTrac. 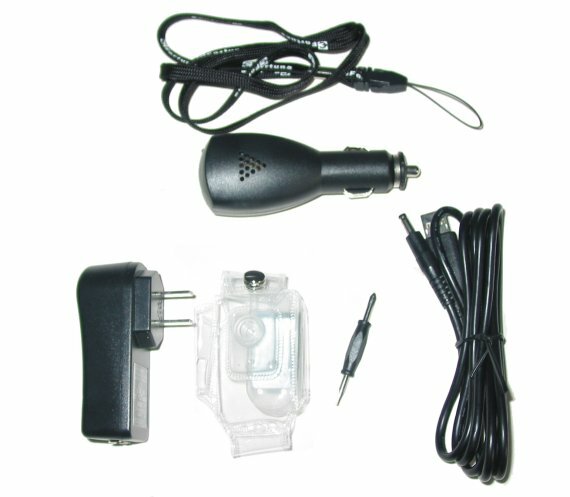 Standard mode is what you will see on all normal SiRF GPS Receivers using SiRF Star IIe/LP chipset, where as XTrac is the firmware addition that brings in a better stabalised and stronger signal in hard to reach places like when you are under heavy foliage or between skyscrapers. Switching between ST and XT modes is easy once you know how. It looks like you have a power switch and an ST/XT switch. This isn't the case as you will find out when you un-box your Clip-On. What you have to do is power the receiver off, this then exposes a back plate to the right of what looks like the ST/XT switch, and in here you will see a little pin-prick hole. You then use a pen, compass point or other similar device and push this to the right for XT (Xtrac), or to the left for ST (standard mode). My main gripe with the Fortuna Clip-On is the ST to XT button. The instructions really don't explain how to use it, and it looks like you have a power switch and an ST/XT switch, but the switch look like it's in ST mode when OFF and XT mode when ON. This is something I believe Fortuna could have made much better and had two switches that worked independently of each other. Now that would have made sense! However, having it hidden away like this means you won't accidentally switch it to XT or back to ST mode which I suppose really is the objective here. The image to the right is currently showing the Fortuna in ST mode (with the pin prick hole on the left), switching the Fortuna off and pushing this pin hole to the right will move it into XT mode, but this can only be done when the GPS is off, as the slider to the left covers the hole, and Fortuna are doing something special here by gating between different chips so you do have to have the GPS Receiver powered off for this. One thing Fortuna have done extremely well is to bundle the Clip-On with all the accessories you think you may need. The first thing is a jacket/sleeve that you can put the Clip-On into which has a belt clip like below. The next thing Fortuna includes are all the relevant chargers. 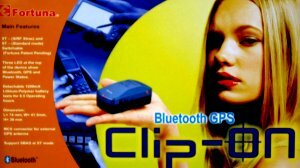 The Clip-On must be one of the first Bluetooth GPS Receivers to come with both an in-car and mains charger for US (although the recently reviewed Holux GR-230 also comes with this). European users will have a Euro adapter whilst UK users will also have a specific UK adapter included. Fortuna also give you a little screw to permanently screw the battery cap on, and not only that, they give you a screwdriver to enable you to do that! You also get a hand/neck strap and a USB cable that plugs into the mains and car chargers to power/charge the GPS. I am impressed! If you take a look at the following photo which includes some of the newer more popular Bluetooth GPS Receivers, you will see just how small the Fortuna Clip-On really is! 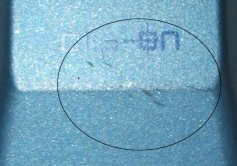 SiRF XTrac - What is it ? One thing that needs to be understood with high sensitivity GPS Receivers, or GPS Receivers running the SiRF XTrac firmware is that these receivers do something special. With regular GPS Receivers, most will only examine the strongest 7 or 8 satellite signals and focus their attention on bringing a signal in from these satellites alone, discarding the rest. High Sensitivity GPS Receivers and those using the SiRF XTrac software will not discard the remaining signals, in-fact they will utilise these to give you a stronger fix, so if you are in a difficult position, under heavy foliage, or even indoors you should be able to get a satellite fix (albeit reduced). However to do this, they are receiving weaker signals from other satellites that may not be fully in-view, which means that the data they are receiving may not be as accurate as the data from stronger satellites. This in-turn can sometimes create what appears to be lag when used in-car driving at speeds, or can depending on the software you use snap you to a road that is close by because the positional data isn't quite as accurate as it should be due to the weaker satellite signals. Please note there is nothing wrong with the GPS. Compact Flash GPS Receivers really come out best when used out walking and hiking, and this is where High Sensitive and SiRF XTrac GPS Receivers come out the best, when walking through heavy foliage like trees or forests. Most people won't experience lag, but it depends on the environment you are in, the speed you are traveling, how fast you are accelerating or decelerating, and the mapping software you are using. If you would like to read more about SiRF XTrac and see the benefits and pitfalls, please read the XTrac Or No XTrac article. I like the Fortuna Clip-On, it's small, lightweight and performs very well even under heavy foliage. If you need a little bit more signal then switching to XTrac mode will make the difference and help you retain that fix in difficult places. The Clip-On performs extremely well, topped with 8.5 hours battery time, and a replaceable Lithium battery, you've got everything you need in a small package. Not only that the Clip-On comes with a host of accessories for wearing the Clip-On either on your belt or around your neck, and is included both with a mains and car charger! What more can you ask for ? The downside I have noticed is that wearing it around your neck, as it's quite deep it never sits squarely on your chest and rolls around a little, and if you are wearing button shirts after a day of wearing they tend to chip away at the paint work on the top of the GPS, so although I like the ability to wear the GPS, be prepared for some wear and tear showing, or make sure you place it in the protective sleeve!